Award-winning author and performance artist Tim Z. Hernandez writes about the lives of the marginalized, about poverty, small-town families and rural landscapes like few American writers can. In his most recent works, Hernandez takes on issues of identity in new ways, uncovering real-life mysteries and giving voice to stories that have remained undocumented for decades. 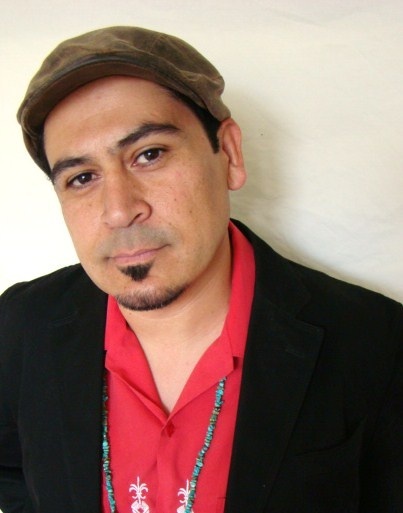 Hailed as one of sixteen New American Poets by the Poetry Society of America, Tim Z. Hernandez earned an MFA in Writing and Literature from Bennington College. His first collection of poetry, Skin Tax (Heyday Books, 2004) won the 2006 American Book Award and subsequent work has earned him such accolades as the 2010 Premio Aztlán Prize in Fiction, the James Duval Phelan Award, and the Zora Neal Hurston Award for Fiction. His poems and stories have appeared in numerous anthologies and journals, and his work has been featured on NPR’s All Things Considered. With the debut of his most recent collection of poetry Natural Takeover of Small Things (University of Arizona Press, 2013), Hernandez welcomes two new projects Mañana Means Heaven (University of Arizona Press, 2013) and All They Will Call You. In Mañana Means Heaven, Hernandez investigates the life of “the Mexican girl” from Jack Kerouac’s classic novel On the Road. What began as an idea to write the fictionalized version of her life, developed into a near-obsessive desire to find the woman and introduce her to the literary world that knew nothing about her. All they will call you will be “deportees”. Tim Z. Hernandez discusses his work in this question and answer interview for Poets’ Quarterly. The first poem in your most recent collection of poetry, Natural Takeover of Small Things is titled “Home,” and it sets the theme for the poems to follow. Why is it important to write about this particular place—Fresno and its surrounding communities? I’ve lived inside and outside of the San Joaquin Valley for many years, and have been able to write about it with some degree of perspective because of it. In this book, Fresno is really a composite of all the communities in that region, and in fact, I believe it is reflective of Anytown USA, where agriculture is God. This is ultimately what I hope to convey in this collection. The interconnectedness on all sides of existence, particularly as it surrounds the world of big/small ag business and the intimate lives of those who depend upon it. Of course, the perspective here is from the people themselves, the ones who have never had their stories told, who recede in the shadows. What role did your own connection to place and landscape play when working with the investigative projects that followed? I’ve always wanted to learn the most I can about the place I call home. This means hanging in the dark corners just as much as it means basking in the light. It means asking questions mercilessly, digging, picking at old and fresh wounds. Moving forward like this with the understanding that nothing and no one is exempt. Beginning with what we call “history.” Who wrote it? Where did they get their information from? And what about that source? And so on. And when I’m not satisfied by an answer then the next step is to do the research myself. This is what I was doing when I stumbled across the ideas for Bea Franco’s book and now this Los Gatos plane crash book. I was asking questions, except that here at home, the SJ Valley, I had the resources readily available, since I’d been working in non-profits there for over 16 years. You seem to have your pen in so many genres—poetry, fiction, and now historical/creative non-fiction. How has your practice in these genres influenced the way you write through new projects? Do you find that one genre leads the charge against the other, or has your writing transcended genres? Yes, when I first began looking at writing seriously I didn’t think of it in terms of genre, I was only interested in language/ text as a medium. I explored poetry first because it seemed the most accessible at the time. But in my poems I discovered there were characters that wanted to speak. This was my foray into prose. Also, my work in theater and performance art informed what I wrote. I often found myself “telling stories.” I realized that “stories” were what I was after, and I’d use whatever form or genre necessary, without concern about what it was called. Of course, in order to do this effectively I had to spend time in the various areas. Only now, after having written three collections of poetry, two novels, and a handful of theatrical pieces, I am starting to feel like my work is once again using language as pure medium, especially with this recent book about the Los Gatos plane crash. It’s something of a documentary book, that when complete will include flash non-fiction, testimonials, found language poems, media clips, song lyrics and photographs. I feel like all of my writing experience thus far has been leading up to this one book. Tell our readers a little bit about the process of writing Mañana Means Heaven. The book started as pure fiction, but when I got about 100 pages into it, I ended up finding Bea Franco and her family. They were living only one mile from my home in Fresno at the time, and she was still alive. So I put aside my “book” and started all over again. I began interviewing her, and her son Albert. He is portrayed as “little Johnny” in Kerouac’s book. After about two months of interviewing her, I started to write. I had to use various sources to confirm facts, dates, etc…some of which included Kerouac’s journals, Bea’s interviews, her letters to him, and family photographs. I knew I wanted to keep her own voice in the book somehow, so a lot of the dialogue is taken directly from our interviews. In some chapters there are long pieces of her dialogue, so eventually it’s as if Bea herself is telling you her story. In short, the book is not about Kerouac, it is about Bea Franco, who she is, and the circumstances in her life that led her to meeting Kerouac, except that it’s told in the same 15 days they spent together in On the Road. You’ve mentioned that the idea of lineage is partially responsible for getting you on the path towards writing Mañana Means Heaven. Do you feel like your recent works also pay homage? I don’t typically pay too much attention to “literary lineages,” per se, but I believe in what my grandfather used to say, “the past is always working on us.” In this way lineage is inherent, and it’s mostly in this way that I feel lineage is relevant. Whether it is our familial, cultural, or individual history, it’s important for us to regard where we come from and who we come from. But in terms of my writing, I’ve never really aligned myself with any one lineage. I know people have spoken about a “Fresno School” of writers, but that’s far too general. You have supremely contemplative writers like Lee Herrick next to straight-talkers like Larry Levis. There are so many things and people and movements that influence my writing and way of thinking that it would be impossible to pin to one thread. Many of your conversations with the Bea Franco, the “Mexican girl” in Kerouac’s On The Road, happened in the presence of her grown children, and your most recent collection of poetry is dedicated to your own children, “so that they don’t forget”. Well, the old saying is true; if we don’t tell our own stories no one will. Or if they do, it will likely be wrong or severely askewed. This is the case with both books, the one about Bea Franco and the plane crash book I’m working on now. In Bea’s case, Kerouac wrote his version of her life in the forties, through his lens, and no one has ever written it from her point of view. Until now. In the case of the plane crash victims of Los Gatos, people know the version as told in Woody Guthrie’s lyrics, which was fiction. And this fictional account has only existed in the folk music community the world over since the early fifties. Until now. Because of the amount of research these projects have required, and in seeing so many inaccuracies in what we call “non-fiction,” I now question everything that is deemed to be “true.” The only solution, I feel, is to seek our own answers. This is how both of these book projects got going. All They Will Call You is the book you are currently writing about the 28 deportees that died in the Los Gatos Canyon plane crash. =. In writing the book, you became involved in creating a memorial for the men and women who died without a proper marker at their grave. These folks have been buried at Holy Cross Cemetery in Fresno for 65 years with nothing but a stone marker. Only until about ten years ago an anonymous donor put an actual headstone there, but it simply reads: “28 Mexican Nationals who were killed in a plane crash are buried here.” Now that we have the full names of all 28 people we want to erect a new headstone with those names listed. We plan to do this in a public event slated for September 2 of this year, Labor Day. These are the only details we have right now. Our efforts for the most part were in raising the $10,000 needed to make it happen, but as of May we finally did that. What type of reaction has the endeavor received from the public? Folks from all over the country are showing their support. Mostly these are people who are fans of the song, or are part of the folk community, so a lot of our effort has been to reach out to the Latino community and let them know about this. And we’ve had an outpouring of interest in this regard. Recently, in the small predominantly farmworker town of Dinuba, California, a High School teacher of a Mexican American History class talked to her students about this incident and they were moved to support the fundraising efforts by holding a bake sale. It was inspiring! I see this as a sign that the Latino community is starting to take ownership over this piece of history. What’s the value of a name? Well, in the end our names are all we have, they’re our proof of having once existed in this life, of having been. They are our link to the past, to our family, spirituality, culture. When we want to know our family lineage we look to our last names. When we want to honor a parent or grandparent, or someone special in our lives we give our children their middle name after these folks. And of course whatever we decide their first name to be, it’s usually our way of saying, you are the future of this family. Names hold power, they are symbolic and in this way they become the source of our individual and collective magic. I see so many ribbons connecting pieces of your projects to one another and I can’t imagine that it’s something accidental that has led you to the kind of work you’ve been doing lately,. Do you feel like there’s something larger than you—something divine—guiding your work? Yes, that’s a good way of putting it. I’ve been a community organizer for 17 years, and I’ve worked in the humanities field for almost just as long. I mention this because I’ve always been interested in praxis, that is, action that evolves from a piece of information. I feel the real work is being out in the community, helping people get their needs met, or addressing an issue like teen pregnancy or bullying. Or driving far off the beaten path to some rural school in the San Joaquin Valley or the eastern plains of Colorado and opening up young students to the power and joy of language, this is where it’s at for me. I mean, ultimately, we have to live before we can write, don’t we? So in doing this work, in keeping my eyes on what matters most, I feel like a poem or book that emerges from this type of work is bound to have these moments, or occurrences of “divinity,” as you put it. The whole idea, for me at least, is to get as close to the essence of “truth” as possible. And right now, it seems like the more points of view we have, the more voices that participate, the closer we might be to that idea. Singularity is exclusive, and perhaps dangerous. What has been most fulfilling for you in uncovering these stories? This is tough to answer right now. The first thing that comes to mind is that the families will now have some semblance of closure. As of September of 2013 they will now be able to visit the gravesite of their family, and see how they were a part of history, and know that they will no longer exist in obscurity. Juan Luis Guzmán earned an MFA in Creative Writing from California State University, Fresno, along with degrees in English and Mass Communication/Journalism. A member of the Macondo Writers Workshop, and a fellow of CantoMundo, his poetry and fiction has appeared in a number of publications including BorderSenses, Huizache, CRATELit, and Pilgrimage. He lives in California’s Central Valley and teaches writing at Fresno City College.